What is EasySpot for Cats? EasySpot for Cats is a topical flea, tick and lice treatment developed specifically for cats. The waterproof solution kills adult fleas before they lay eggs, ticks, and chewing lice, and prevents infestations for one full month. The easy to use applicator is applied to a single spot and provides pest protection for cats of all sizes. Gentle enough for use on kittens eight weeks of age or older. EasySpot for Cats contains fipronil, a parasiticide that targets the nervous system of pests. The topical treatment is applied to the skin and spreads into the hair follicles, killing adult fleas before they lay eggs, ticks (brown dog ticks, deer ticks, American dog ticks and lone star ticks) that may transmit Lyme disease and chewing lice. EasySpot for Cats contains fipronil, a parasiticide that kills fleas, ticks, and chewing lice by targeting the nervous system, resulting in hyperexcitability and death. 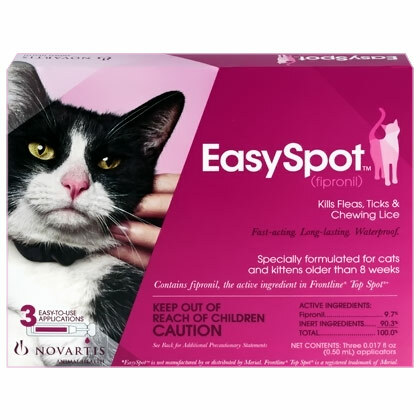 EasySpot for Cats is a non-prescription product. The topical solution should be applied monthly to a single spot between a cat's shoulder blades. Monthly application is recommended for control of flea, tick and chewing lice infestations. Only one applicator per treatment is needed. Repeat application may be made if necessary, but do not apply more often than once every 30 days. Rarely, sensitivities may occur after using any pesticide product. Cats may experience some temporary irritation at the site of product application. If signs persist, or become more severe within a few days of application, consult a veterinarian immediately. Certain medications can interact with pesticides. Consult a veterinarian before using on medicated, debilitated or aged cats. For external use only. For use on cats and kittens only. Do not use on kittens less than eight (8) weeks of age. Avoid contact with eyes, skin or clothing. Turn the tube over and use the opened tip to part the cat's hair between the shoulder blades. Firmly squeeze to apply all of the solution to the cat's skin in a single spot on the cat's back. Apply year round, every 30 days for maximum flea and tick protection. Wait 24 hours after treatment to bathe cat.